Car servicing and repairs can be very costly, so it’s understandable why most people hate going to a mechanic. But if you do not service your car regularly, you may end up spending more money than if you have paid your mechanic a visit on a regular basis. Luckily, with the endless internet possibilities, these days there are extremely helpful sites like www.mycarneedsa.com who will find you the cheapest and best car service for you. MyCarNeedsA only requires from you to enter your registration number and what does your car needs, and their partners, who specialize in car maintenance, repairing and servicing will bid their prices for repairing the damage of your car. After the bidding is closed, all you have to do is choose the best deal for you. MyCarNeedsA can even educate you on the types and level of damage your car has and help you decide if it’s better to repair the car or just sell it for parts. 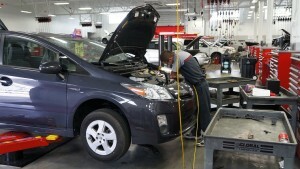 Nevertheless, there are still a few things you can do to avoid costly car repairs, and this article will teach you how. Stick to the maintenance schedule as it is defined in your owner’s manual. A proper maintenance to your car is the most important thing you need to remember. Adequate and timely car maintenance can save you a lot of money in the future and your car will always be in the best condition possible. Timely changes of the fluids, filters and spark plugs can help you prevent many possible future problems with your car. A great tip to prevent certain problems is to upgrade your motor oil to high performance synthetic oil. This will not only prevent problems and expensive repairs in the future, but will also improve the overall performance of your car. Properly inflated tires mean that the tires should not have too much or too little air. If they have too much air, this may cause a blow out. On the other hand, if they have too little air it can result in an excessive wear and tear. Although often times some of the noises may be perfectly normal and they are not a cause for concern, it is always good to be aware and proactive, as sometimes these noises can mean that there is an underlying issue with your car that needs to be checked out. You can describe the type of noises that your car makes on MyCarNeedsA car service and they will tell you if this is normal or you need to get your car checked.